When it comes to mountaineering, the gear you wear can highly improve your experience or play a role against you. The needs for a mountain gear are higher than many other activities, because you will have to face, not only changeable and difficult weather, but also difficult terrains, highly clothe-damaging situations, and sometimes low temperatures, all while you have to be able to move around quite a lot and be flexible. So no ordinary pants are fit for these tasks. You have to for mountaineering gear (especially pants) that can endure all these characteristics and allow you to move freely. If you already knew this, we welcome you to our section and hope you can find some great reviews and information to help you get to a decision about the best mountaineering pants for you. But if you are still not sure if this is what you need to, we can help you. These types of pants are perfectly designed for outdoor activities in mountain terrains, such as rock climbing, trekking and many more. This is why they are made of really lightweight and flexible materials that facilitate high mobility and can stand the conditions typical in a mountain; cold weather, wind, sun, rough landscapes and more. There are two main types of pants you can go for when hiking or camping in the mountains: the hardshell and the softshell. The name is referring to the fabric used to make them. This fabric is designed to give you the maximum weather protection possible. They are water proof, windproof and abrasion resistant, all while still remaining fairly breathable. 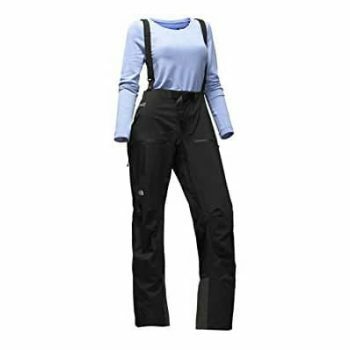 These pants are perfect for prolonged and intense activities outdoors, and might be one of the best ice climbing pants you can find because they offer great weather protection, but on the downside they are not as breathable. With hard and demanding activities, you can get wet with perspiration which is not the greatest idea in low temperatures. The softshell pants on the other hand are among the most popular options for mountain gear, because they provide more flexibility than the hardshell when it comes to movement. This makes them great for moving around when climbing, hiking and outdoor moving activities. The best softshell pants there are usually windproof, water repellent and very breathable as well as flexible, but they are not usually insulated or water-proof, although they tend to be warm because of its fabric and due to their windproof ability. They can be used under and above other fabrics as a way to get more benefits from different types of fabrics. Now, having decided if you should go with a hardshell or softshell, there are different characteristics that your pants should also cover. This is highly important when climbing a mountain or during low temperatures, because it can help you with staying warm. Given that most softshells do not come with thermal insulation, having a windproof quality is a way to make sure you can stay warm, and also not having to put two or more layers of clothing that might impede your activities. This is often seen as an opposite of windproof, but it is not. In fact, they complement each other well. The pants should be windproof to not allow much wind to come through, but breathable enough to permit your body to evaporate the sweat it produces and not maintain the heat inside enough to damp or “overheat”. Water resistance is another great plus to have on your mountaineering pants, because you might face unpredictable weather, or things like wet snow. Most softshell pants are not completely water resistant because this feature tends to compromise the pant’s ability to breath, but the resist light rain or dry snow fairly well. This one is really important when it comes to pants that are designed for hard activities that involve much movement. If the pants are too heavy, they might compromise your movement, but if they are too light, they might not offer enough protection against the elements. It is a matter of balance. Depending on what you might need, some key features that can help you a lot are suspenders, for maintaining your pants into place, the amount of pockets, reinforcement on knees and highly flexible areas among others. Abrasion resistance might be very useful, as well as in some cases, insulation. It is a matter of choosing the features that you might need. Now that we have seen some key factors when choosing the right mountaineering pants, we should review some popular pants, to facilitate the decision making. Consider the factors above, and your own needs as well as the reviews, and we guarantee you that you will choose the correct one. 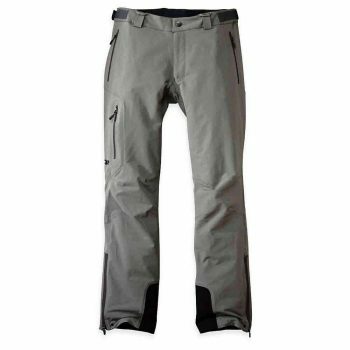 These pants are a perfect option for cold weather hiking, because they have a synthetic insulation of up to 80g. This insulation is great for temperatures as low as 10 degrees Fahrenheit, and they won’t allow you to get cold. Mountain Hardwear Compressor Pant are also wind-proof, which will help you with the weather too, as usually weather is one of the main conditions you will have to face against when rock climbing or trekking on the mountain. Also, to help with the breathability of the pants and also to make putting them on and off a lot easier, these pants have side-zippers that go along the whole leg. Lastly, they are really lightweight and easy to carry around because they can be compressed a lot, so these pants are a great option for activities that require a lot of movement. Thanks to its ripstop nylon and its reinforced seat and knees, they are also very durable, taking into account how lightweight and comfortable they are. 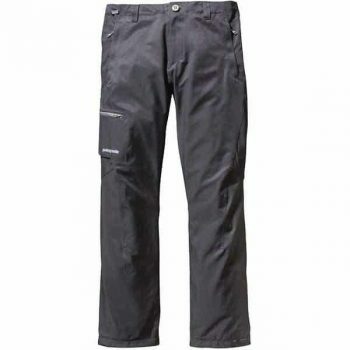 The Patagonia Simul Alpine Pants are great for glacier walking and many other snowy activities because of its Durable Water Repellency coating that makes them stand water and snow without permitting wet to come through. This is a great thing for this kind of activities, allowing you to stay dry. 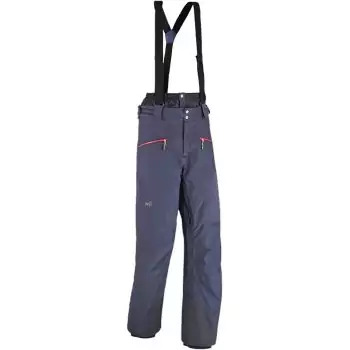 The pants are really lightweight and breathable, which makes them great for demanding activities like climbing, or trekking since their articulated cut and gusseted crotch gives them a lot more flexibility to help you move with no problem on those situations. The narrower lower leg and their adjustable cuffs also help a lot with making them comfortable to wear during hikes or climbs, since they ensure the right placement of your gear. The pants also come with an OppoSet waist adjustment to help your pants stay at place, but it can sometimes move and become a bit annoying instead of useful. The Outdoor Research Cirque Pants are a great option for cool but not so low temperatures, and outdoor mountain activities like trekking. They are flexible enough to allow movement without getting to loosen to get in the way of you activities. Also, they are windproof and weatherproof which means you can face difficult climates with no problem. They can withstand light rain and dry pretty quickly when wet, so you can carry them around on your treks without too much worry. If you would like to, you can add a pair of suspenders to help you with maintaining your pants into place when moving around a lot, and they also come with articulated knees and a gusseted crotch to improve moving as well. These lightweight and comfortable pants are great for many things, but the only downside with them can be that they are not as breathable as they could be, because of the wind and water resistance properties. This makes them good for cool to low temperatures, but maybe not the right choice (by itself) with below zero temperatures. Related: These pants come with the option of adding suspenders to help with using them in highly moving situations. You can find the Outdoor Research Suspenders Belt here. Best Use: snow/water activities, backpacking, Alpine climbing. The North Face Dihedral Shell Pants are perfectly designed to be able to stand hard weather conditions. These pants come with a Gore-Tex technology which allows them to be water-proof, windproof and also still be very breathable and flexible. This is a perfect characteristic in a pair of pants made for mountain treks because you will not be vulnerable to the difficult conditions and the unpredictable weather. Also, the pants have an alpine fit and which helps with movement, making them great for intensive activities like rock climbing and skiing. They are fully seamed as well, so water or snow will not find their way in and you will stay dry but they are also breathable enough so you can have both the benefits of weather protection and breathability. Lastly, a few other features come handy with these pants. 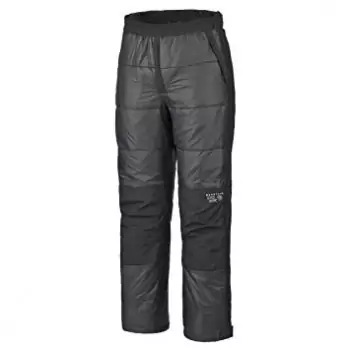 They come with a ¾ side zipper which is great if you feel like it’s getting too hot, since you should consider that pants with windproof and waterproof finish tend to be less breathable than other pants without it. On top of that, to help with the fitting, they come with suspenders which are removable, so you can have more versatility and help with keeping your pants into place while moving around. 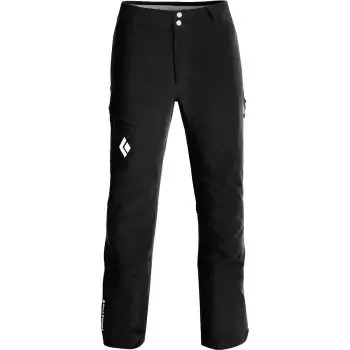 Only thing you should consider: these pants do not have good insulation, so for really low temperatures you could use an inner insulated base layer. The Haglofs Mid II Flex Pant is a perfect option among hiking and climbing pants, because of it stretch fabric that makes you move with no problem and does not limit your flexibility. Its fabric, mixed with articulated knees, will insure you mobility at all times, and its lightweight and breathable fabric can make you feel your wearing pajama pants instead. But make no mistake, these softshell pants are both comfortable and durable, and thanks to its durable water resistance treatment, you do not have to worry about light rain during your trip and they dry pretty fast. The pants also come with a 30+ UPF sun protection, which is a great thing if you consider that at higher altitude where there is direct sunlight into your skin. Lastly, to make getting boots a lot easier, the pants have zippered cuffs to enlarge the ankle area, and they also come with several pockets which facilitate carrying your most important items, like the GPS. Again, you should consider they are not insulated, and although warm enough for autumn temperatures, you might want to add another layer for lower temperatures. Best Use: Snow weather activities, Alpine climbing, alpine trekking. The Millet Curve Stretch GTX Pants are the go-to for snow and low temperature activities. They come with pretty much anything you might need for your snowy adventures. The waterproof fabric with Gore-Tex technology helps you stay dry for longer, which is a great thing when you will face not only dry snow, but also the wetter kind. This also helps you carry way fewer things with you; and considering these pants are not the most lightweight there are, that makes them a great option. Their Gore-Tex technology is also windproof, which is great for the snowy weather you’ll face, but it also remains pretty breathable, which will help you stay warm, dry and still not “overheat” yourself in the gear. The best thing about this might also be its Primaloft synthetic insulation, which allows you to be under really low temperatures with no problem. Great for those snow activities you would like to practice, like skiing and snowboarding, and also for alpine climbing and trekking. These Black Diamond Dawn Patrol LT Pants are a great option for high mobility mountain activities, because they are made out of a really lightweight stretch-woven shoftshell material, and it allows you to be as flexible as you need and move around with no problem. This is great for hiking, climbing and many other high demanding activities. Also they come with articulated knees, which help a lot with mobility as well, and are perfect if you are planning on climbing. They come with a Keprotec reinforced kick patches that protect you against the missed crampon kicks if you are ice climbing as well. Their NanoSphere technology permits this pant to withstand conditions like snow weather and wet ice without getting wet, but keep in mind they are not insulated, so you might need an extra layer for really low temperatures. They are also wind resistant but highly breathable, perfect for those high demanding situations that would make you sweat, and in which you would not want to stay wet and cold. Best Use: Summer/Spring/Fall outdoor activities, rock climbing, alpine climbing, backpacking. 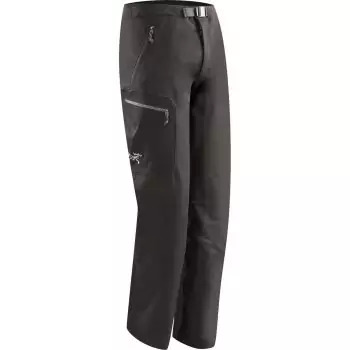 The Arcteryx Gamma AR Pants might be the best one for three weather activities. They are very comfortable and lightweight because of its fabric, and also very flexible because of their 4 way stretch feature, which means you can make long walks and hard movements without losing mobility. Its fabric is called Burly Double Weave, which other than being stretch, is moist and wind resistant, to help you with those outdoor activities where weather might play against you. They also have a Durable Water Resistance finish to make them water-proof, so light rain will not stop you. Water-proofing might usually play against breathability, but these pants are very breathable, and have a soft brush inner face to keep you warm and comfortable. 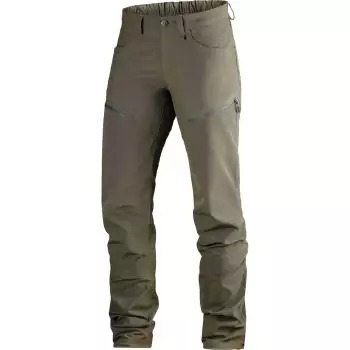 Another great thing about these pants is their abrasion resistance, which makes them very durable and also great for activities where you might face difficult land or high mobility. You should consider that while it’s warm enough for fall-like temperatures, when facing one digit or below zero temperatures, you might need an extra layer because it does not come with insulation. Now, that you know about which types of pants to go for, and the different conditions they might face, and you have seen some reviews comparing different types, we hope you can make the right choice, and get ready for your next mountain adventure. If you consider we might have missed something, please let us know in the comments below, and also tell us, what are your favorite mountaineering pants? And what features do you think the perfect pants should have?